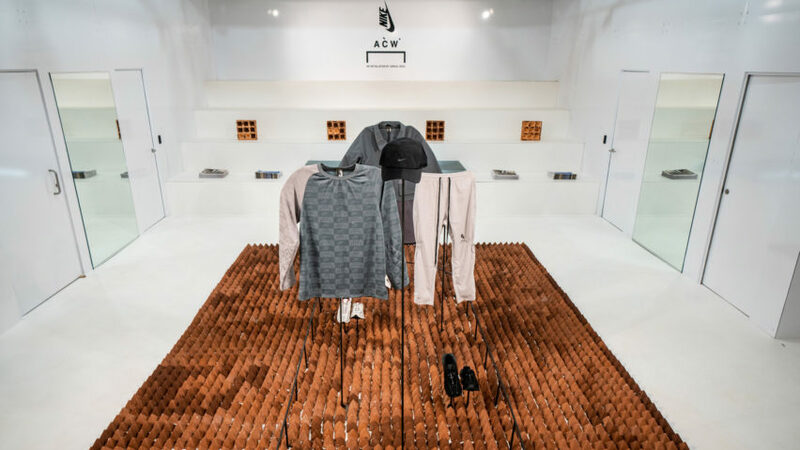 The new Nike capsule collection by fashion designer Samuel Ross has been unveiled in London against a landscape of 4,000 tiny terracotta pyramids. Students from the Architectural Association created the installation inside Nike's 1948 retail space, for the launch of Nike x A Cold Wall. For two days, 16 and 17 November, visitors were invited to step on the small clay structures, eventually crushing them and leaving a pile of rubble in their place. The aim was to demonstrate how an object changes over time, which was also the main driving force behind Ross' collection. The four garments – a pair of trainers, a parka, a long-sleeved top and trousers – were presented at the centre of the space, displayed on a curved structure made up of pointy metal beams. The structure was designed to resemble the shape of Hayward Field's inner track boundary, a track and field stadium that the students describe as the "birthplace of Blue Ribbons Sports and the symbolic epicentre of Nike worldwide". Blue Ribbon Sports was Nike's original brand name. Two other rooms in the store were also transformed for the launch. One featured a curved maze of copper mesh walls, while the other, a cinema room, screened a promotional video for the collection. Ross' brand A Cold Wall is one of the biggest names in British streetwear right now. This latest collection, described by Ross as having a "stark and hostile feel", is designed to change its appearance as it ages – a quality that aims to put the wearer at the centre of the design process. "I am interested in how a garment ages and taking the user on that journey. That is something I believe should be encouraged. It's much more human. It's much more dynamic as well," said Ross, who previously collaborated with Nike on a pair of Air Force Ones. The first item in the four-piece collection is a reworking of the 2010 Nike Zoom Vomero +5 trainer, which is available in black or white. It features a plastic, built-out heel. Ross also removed the polyurethane coating from the original model to accelerate its ageing process. The intention was for the product to change colour as it ages, encouraging an active relationship between the wearer and the trainer. "With the Vomero, there has been this opportunity to really exalt the technology of its time and modernise the aesthetic, without compromising its purpose and function," said Ross. "It's interesting to look at a shoe which has such a beautiful and polished wire frame, and then to be able to isolate individual aspects of that shoe, to really exalt the technology. It is very exciting to take something that is very beautiful and to not necessarily reinterpret but to reevaluate the product," he explained. Also in the collection is a parka made of a special Japanese nylon that regulates body temperature by softening with warmth, releasing excess heat and moisture. A pair of trousers and a long-sleeve top – both in earthy, muted tones – complete the collection. The Nike x A Cold Wall capsule collection launched globally yesterday, 29 November. Other recent collaborations from the brand include a new version of the Nike Mars Yard trainer by New York-based artist Tom Sachs.